Folio 93r of the Codex Atlanticus is devoted to the study of a very complex musical instrument that has never seen the light of day until now. While there’s no record of whether or not Leonardo ever made a physical version of it, the detailed nature of these drawings implies that he may very well have built a prototype. The small drawing in the lower part of folio 93r in the Codex Atlanticus gives an extremely clear idea of the instrument and how it would be used. A belt would allow the player to wear it and play while walking in processions. 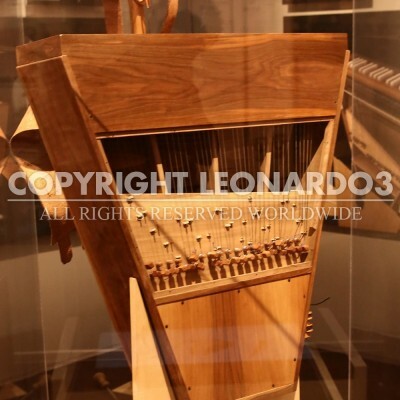 However, the most interesting and innovative aspects are to be found in the details, which portray Leonardo’s extraordinary intentions (a polyphonic, dynamic sound) and convey what an exceptional inventor he was, even in the sphere of designing musical instruments. Our reconstruction has been baptized the Harpsichord- Viola: “harpsichord” after the polyphonic, though not dynamic, keyboard instrument, and “viola” after the primarily monophonic string instrument. The Harpsichord-Viola is played as a keyboard instrument though it emits a sound similar to that of a viola. In fact, the sound is produced thanks to a long horsehair that, when the keys of the keyboard are pressed, graze the strings in a way to similar to that of bowed instruments. 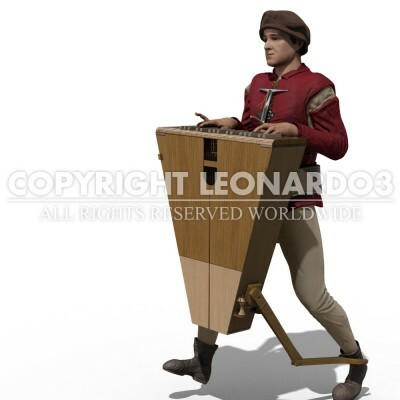 But while on the latter, a musician alternately moves the bow back and forth,in the Harpsichord-Viola, the horsehair moves continuously, propelled by a complex motor apparatus activated by the musician’s leg as he walks. Unlike a viola, which is mainly a monophonic instrument in that the bow can only “graze” one string at a time, or two at the most, with the Harpsichord- Viola one can play more than one note at the same time, like on a piano, which didn’t exist in Leonardo’s time.